The Khan family on horse back. 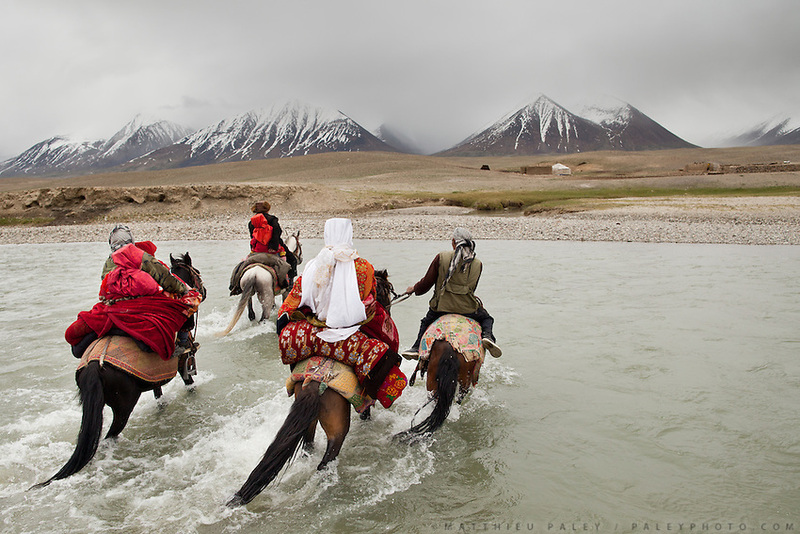 Nomads by necessity, the Kyrgyz move seasonally across Afghanistan's Pamir, a high altitude plateau stuck between China, Tajikistan and Pakistan, where the world's highest mountain ranges converge..Today, the Khan's family is leaving for their summer camp. Everything they own needs to be tied to the back of yaks, including a dozen teapots, a cast-iron stove, a car battery, two solar panels, a yurt, and 43 blankets...Moving with the Khan (chief) family from the Qyzyl Qorum camp to the summer camp of Kara Jylga, on the south side of the wide Little Pamir plateau...Trekking through the high altitude plateau of the Little Pamir mountains (average 4200 meters) , where the Afghan Kyrgyz community live all year, on the borders of China, Tajikistan and Pakistan.